The online course consists of the in-depth manual and an online test. 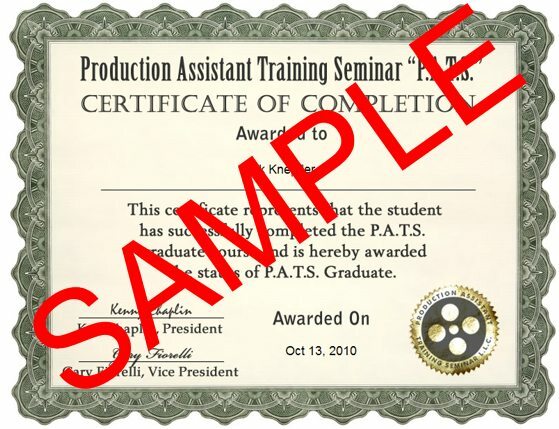 You simply self-study, take the test (get a passing grade of 80%), and you will receive a personalized printable certificate indicating your completion of the Online PA Course. You can retake the un-timed test as needed. Once you receive a passing grade of 80%, you may log in at any time to print your certificate. With more than 30 years of combined experience, the P.A.T.S. team of Kenny Chaplin and Gary Romolo Fiorelli has compiled the ultimate guide to understanding the ins and outs of being a production assistant in film and television production. Our manual and online course provides a thorough overview of set protocol and etiquette; working with talent and crew; and safety practices. It is chock-full of production forms, behind-the-scenes anecdotes and insights as well as a complete glossary of the industry’s complex, and sometimes strange, on-set language. Even industry veterans want a copy of the P.A.T.S. manual! It makes for a great refresher course with its overview on paperwork, script breakdown and scheduling. The P.A.T.S. 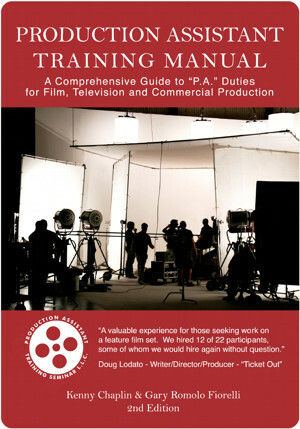 training manual is an absolute must for anyone beginning a career in production AND as a reference for seasoned professionals. "I wouldn't call it a manual so much as a bible. Every time I start a new show, I reference Kenny's material religiously." "This seminar was amazing. I learned so much and would recommend it to anyone who has an interest in working on films."